Considering that the above quote is from the man himself, it may seem strange that I’ve chosen Wolfe for a post in which he’s supposed to look like his writing. But that’s who he is: an outsider looking in. An observer. He’s always one step, very clearly removed from the action he reports – and keeping his distance is one of the things that makes his writing so insightful and true. It’s also what can make it so cutting or full of awe. He’s never been a writer to deliver the most subtle of messages but he’s massively entertaining… brash, fun, exuberant… his writing is zapped with fiendish humour. This entry was posted in - Authors who look like their writing, - On writing, - Quotes from people wiser than me and tagged author, authors, Authors who look like their writing, bonfire of the vanities, books, famous quotes, fiction, inspiration, literature, novel, quotes, story, the right stuff, tom wolfe, writing on May 8, 2013 by beautifulorange. 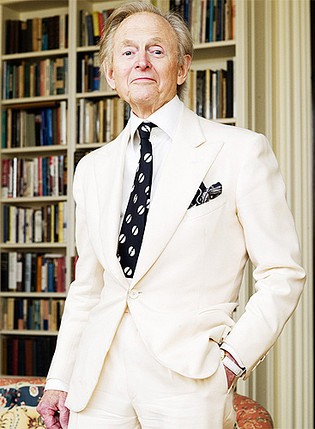 The first thing I am going to do, if I ever finish a novel, is buy a white suit. Seriously. He wears it all the time. In any weather. For the last 40 years. He’s nothing if not consistent. He looks like a pretty fun guy! I bet those shoes are white too. He weird as hell. But a great writer. He started out in the 60s, hanging with Ken Kesey (One Flew Over The Cuckoos Nest) and loads od other influential hippy-type people… it was all about drugs and free love… and he was this guy who was in the middle of it but also just outside of it, writing about it all. It’s what made him famous in the first place. Haha. He’s unique, I’ll say that for him. I think he’s most likely thinking something judgmental about whoever’s taking the photo. Oh, he’s rather fabulous old boy! I feel like checking out some of his books now.